If your house seems a bit more cluttered than usual, you might be temped to throw out items you don’t use. However, you may be throwing away money as well. Instead of breaking out the garbage bins, why not have a yard sale? Not only will it be a source of extra income, but it will also be a great way to “recycle” used items. Need Extra Cash? Host a Yard Sale. First, you need to pick a date for the yard sale. Some last for the entire weekend while others are a one-day affair. Once you select the date, make sure and get any necessary approval from your homeowner’s association or local government. Also, some neighborhoods designate a specific weekend or two each year for yard sales and do not allow yard sales at any other time. Second, try and recruit neighbors to help. 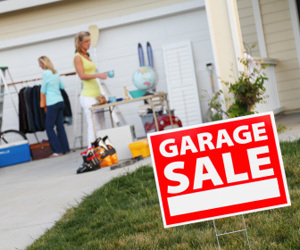 Turning your yard sale into a multi-family yard sale can increase traffic and allow for greater advertising. Third, be sure and promote your yard sale heavily. You can check your local newspaper for yard-sale specific ads. Online sites like Craigslist.org or garagesalesource.com have resources to help with advertising. Be sure to be descriptive about some of the key items you have – baby items, collectibles, furniture, etc. If there are many families taking part in the sale, use terms like “multi-family” or “neighborhood sale” to help let buyers know. To ensure that your yard sale is a success, be sure and read Glass’ full article. This entry was posted in Featured, Green Events, Recycling and tagged equifax finance blog, recycle on September 23, 2011 by Carol Morgan. Its the holiday season and you're probably resting after a long weekend of shopping, right? Probably not the case for many of us, but in this time of buying and gift giving, you may want to consider giving back...to the environment. If a new computer or other electronic device tops your holiday wish list, consider recycling your old devices if they are no longer in usable/"sellable" condition. The EPA is out to educate the US on how to recycle electronics. Through awareness alone, we can begin to be more thoughtful when it comes to disposing of old, seemingly useless electronics. The EPA's "eCycling" page offers information and solutions to recycling electronics; what, where, when and how. The Facts: "Because consumer electronics like personal computers, TV's, cellphones, and stereo equipment contain lead and a variety of other hazardous materials, eCycling, the recycling of electronic equipment, helps protect the environment. And because electronics are becoming obsolete at an ever faster rate, their volume is growing two to three times faster than any other type of waste. It is projected that 500 million personal computers have been taken out of service from 2000 and 2007." Through the EPA's eCycling website, you can learn where to recycle your unwanted electronics. They also recommend donating, of course, because let's be honest...no one is going to buy your Nokia cell phone from 2002 off your eBay account. Instead of throwing old cellphones out, you can donate them or find a way to recycle them. And that is just one example! This entry was posted in Green News, Recycling and tagged environmental issues, green cell phones, green computers, green electronics, recycle on December 1, 2009 by Megan McLaughlin. Summer is wrapping up quickly and you may not have given school a single thought yet! However, now is the time to get ready to hit the books again and, this year, you should consider trying it the green way! There are tons of school supplies that are better for the environment and you don't even have to special order or scour the earth to find them. Most of these supplies can be found right in your usual stores...you just need to know what to look for! - Find a staple-free stapler (so cool)! - Stop using paper bags for your lunch! This entry was posted in Green News, Recycling and tagged back to school, easy green solutions, going green, recycle on August 25, 2009 by Megan McLaughlin. Atlanta — stop throwing it all away. Reduce the amount of land fill space needed and reduce your carbon footprint. Recycle your old electronics at Turner Field on Saturday, November 22 from 9 a.m. til 4 p.m. This event is part of the Sony National Take Back Recycling Program in partnership with Waste Management. Items accepted include: TVs, computer monitors, computer systems, VCRs, DVDs, cameras, phones and other consumer electronics. Turner Field is located at 755 Hank Aaron Drive, Atlanta, GA 30315. This entry was posted in Green Events, Recycling and tagged electronics recycling event, recycle, recycle computer monitors, recycle electronics, sony, turner field, waste management on November 16, 2008 by Carol Morgan. Teresa Boardman brings up several good points about the “green” revolution in her article “Not buying into the ‘green’ movement.” Boardman believes that product manufacturers advertise their products to be better for the environment in order to prey on buyers’ wishes to follow pop culture and become part of this trendy movement. Although these reformed products are better than the original through small changes in packaging or shipping, Boardman points out that often the products themselves are unnecessary and add to the depletion of our resources and the harming of our environment, proving the term “green” to be a marketing gimmick. This entry was posted in Energy Efficient, People and tagged green building, green movement, recycle on July 29, 2008 by Carol Morgan.